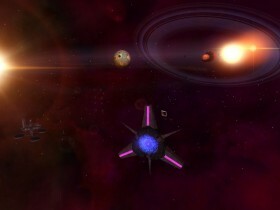 Crossfire System in Sirius Sector. In Crossfire MP it is home for Crossfire Clan BG - Blood Guard. 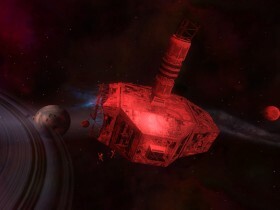 A very important System directly connecting the heart of Liberty space with the X-3043 crossroad. After the discovery of Custodian, a secure jump-gate was built giving direct access to New York. Directly between the X-3043 jump-gate and the New York jump-gate, a huge mine-field was laid down. However the first line of defence was achieved by building the Neutro Station which is positioned between the minefield and the X-3043 jump-gate. The primary function of the minefield and the nearby big guard station, was to ensure that there would be no possibility for any attacker undertaking a snap raid into Liberty space from X-3043. 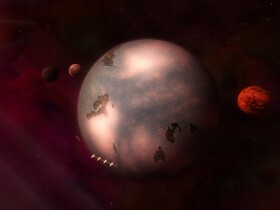 Later, when all four main planets (all located on far end of this system) were populated, a fast Trade Lane was established connecting with the Neutro Station. 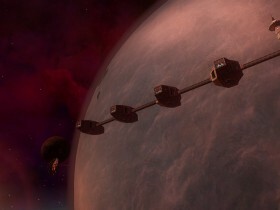 This System has a very rich history and special structures, or theirs remnants, can be found here on Custodian. Next to regular settlers (MP), this system was also home of the police clan the Blood Guard who for a very long time guarded this System against pirate raiders.